IF YOU LIKE THE MUSIC OF CROONERS LIKE FRANK SINATRA, MEL TORMÉ AND NAT KING COLE, YOU WILL ENJOY LISTENING TO THE BLACK TIE JAZZ TRIO. 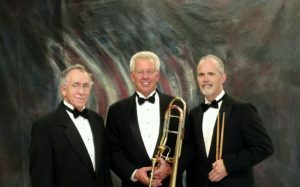 The Black Tie Jazz Trio will perform for Prime Timers on Monday, March 4 at the DeKalb County Farm Bureau. Their performance begins at 1 p.m. in the Farm Bureau Theater. The Trio consists of Kirk Lundbeck, trombone/vocals; Denny Vaupel, keyboard/vocals; and Joe Pasteris, percussion. Each of the local musicians has a degree in music and has performed a wide variety of musical styles throughout their individual musical careers. Combining their talents, the Trio plays music from jazz standards, show tunes in a jazz style, and easy-listening smooth jazz. Before their performance, lunch will be served at 12-noon in the Farm Bureau Auditorium for Prime Timers, Farm Bureau members 55+ years. Lunch fee is $7, payable by Feb. 26.